The ancestry of domesticated cattle proves more complex than previously thought, reports a paper published today in the open access journal Genome Biology. The first nuclear genome sequence from an ancient wild ox reveals that some modern domestic cow breeds, including the Scottish Highland and Irish Kerry, had wild ancestors that were British, as well as Asian. The aurochs, Bos primigenius, is an extinct wild ox species that ranged across the grasslands of Eurasia and North Africa 11,000 years ago. Domestication of aurochs gave rise to two major groups of cattle; Bos taurus and Bos indicus. Previous studies have shown that European B. taurus are descended from western Asian populations of aurochs. However, little was known about the relationship between domesticated cattle and wild aurochs in Europe, and how wild populations contributed to the evolutionary history of the cows that graze our fields today. To build a clearer picture of the ancestry of European cattle breeds, scientists from University College Dublin extracted genetic material from a bone of a 6,750 year old wild British aurochs discovered in a cave in Derbyshire, England. 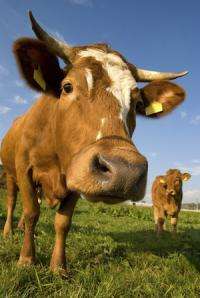 They then sequenced its complete genome - its genetic blueprint - and compared it with the genomes of 81 domesticated B. taurus and B. indicus animals, and DNA marker information from more than 1,200 modern cows. The team of researchers discovered clear evidence of breeding between wild British aurochs and early domesticated cattle. David MacHugh, senior author on the study from the School of Agriculture and Food Science at University College Dublin, said: "Our results show the ancestors of modern British and Irish breeds share more genetic similarities with this ancient specimen than other European cattle. This suggests that early British farmers may have restocked their domesticated herds with wild aurochs." Genes linked to neurobiology and muscle development were also found to be associated with domestication of the ancestors of European cattle, indicating that a key part of the domestication process was the selection of cattle based on behavioural and meat traits. David MacHugh added: "This is the first complete nuclear genome sequence from the extinct Eurasian aurochs. Our new study contradicts earlier simple models of cattle domestication and evolution that we and others proposed based on mitochondrial DNA or Y chromosomes. What now emerges from high-resolution studies of the nuclear genome is a more nuanced picture of crossbreeding and gene flow between domestic cattle and wild aurochs as early European farmers moved into new habitats such as Britain during the Neolithic."